It's the fifth week of 2018 and I've finished knitting the fifth hat out of the 52 I've challenged myself to knit this year. At least I guess I can call it finished. The knitting part is finished. It's currently blocking and awaiting eyes. I should probably only count it as half a hat because.... Sewing buttons on is NOT my favorite thing to do and seeing as the hat has seven owls, which means fourteen buttons.... Perhaps I shouldn't count it at all. I desperately wish I'd thought to use beads instead of buttons for the eyes. I could have put the beads on while I was doing the knitting. Oh well.... Next time. As for the pattern details, I used Oyster Heather Wool of the Andes worsted weight yarn and US 5 needles (also from Knit Picks.) For the owl design, I used an old, photocopied baby sweater pattern that has been hanging out in my loose pattern files forever. I think it's a pretty standard owl-ish cable design if you wanted to knit your own. 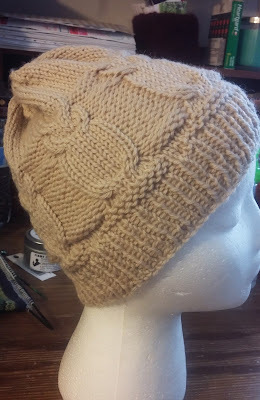 Since I'm currently on a mission to watch all the Harry Potter movies while I knit the Slytherin sock I might have to knit white, gray and brown hats to represent all the owls in the movies. I'm also flabbergasted to realize that apparently, I've only seen the first two movies. How is that even possible? I knit that owl pattern into so many things for my then-little daughter (who like owls before owls were A Thing). Such fun. (Except for the eyes. . . ) Have fun catching up with Harry Potter and friends! That will be adorable with some orange or yellow owl eyes! Nothing captures my attention faster than Harry Potter movies, they are brilliant. Love your new hat. Those really look like owls! I can't imagine even trying to knit 52 hats. You must knit a lot faster than I do -- but the, most people do!